The site of the installation, in its previous life, was a department store. Prior to the exhibit, I had set up a clothing atelier, equipped with templates for cutting fabric, irons and other tools of the rag trade, and a big clock with time cards. 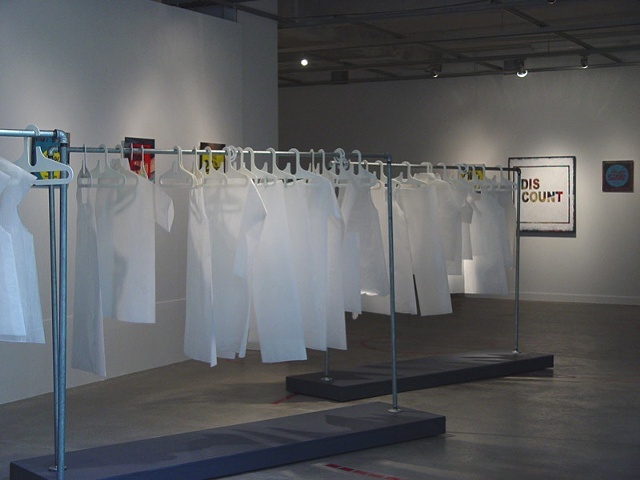 Participants, who were all artists, were given simple instructions and hourly production quota to create garments. On the wall, various “Sale” signs were hung as art. These signs were painted directly over other paintings I had made in the past—the original images could be seen through in some areas. The “Sale” signs on these paintings connoted a surplus, leftover work, and a shift of intention.